A new exhibition at the Alan Cristea Gallery celebrates the recent work of Royal Academicians, contemporary British artists who are members of the Royal Academy of Arts, London. The display will include the first UK showing of a new series of five woodcuts with fabric collage by Yinka Shonibare MBE. Each work in Cowboy Angels, 2017, (pictured) Shonibare’s first project with the Alan Cristea Gallery, depicts a winged cowboy whose face is concealed by an African ritual mask. 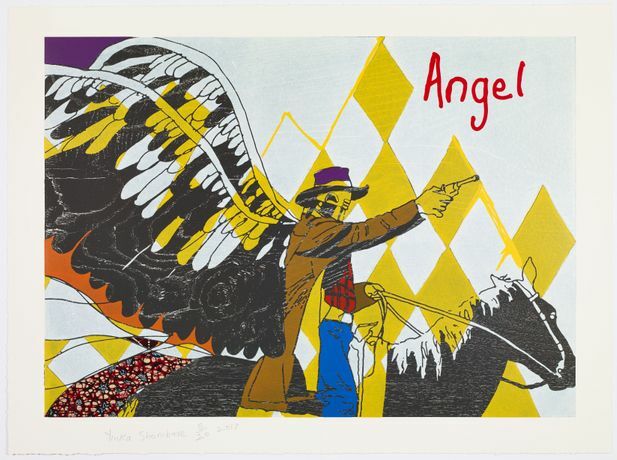 These cowboy ‘angels’ – classic heroes in Western mythology - are an amalgam of cross-national references and religious iconography, which reflect the artist’s own personal history and which he uses to question issues of mixed, and often complex, national and cultural identities. Antony Gormley’s suite of etchings, made by incising copper plates, depict enmeshed, bound figures which evoke states of embodiment and freedom. A recent set of prints by Michael Craig-Martin, entitled Plan and Elevation, 2017, pairs iconic examples of 20th century architecture with their original floor plans. These pairings include Frank Lloyd Wright’s Guggenheim in New York, and Le Corbusier’s Ronchamp, the chapel of Notre Dame du Haut in Eastern France. David Nash’s pastel works such as Pagoda Column, 2016, Red Column Black Column, 2014, and Cork Spire, 2012, reflect the natural formations of his sculpture, which include copses grown and manipulated to form domes, and fallen trees which are carved and charred. 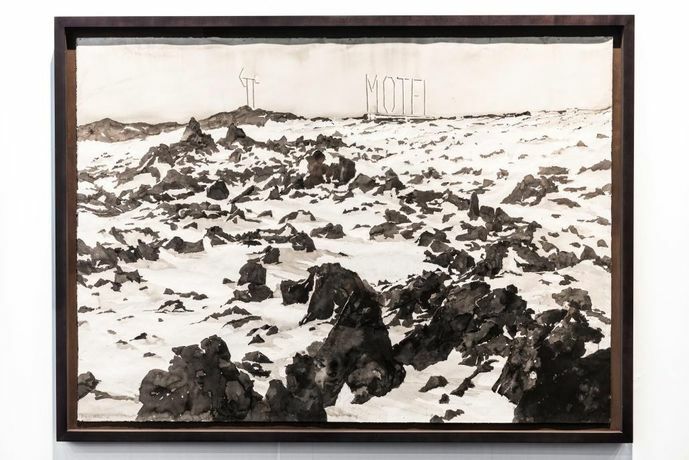 Emma Stibbon, who often uses natural elements such as volcanic ash in her work, will present a large monochromatic drawing depicting the stark and lonely landscape of the volcanic region in Hawaii. As part of the Royal Academy’s 250th anniversary celebrations, the Academy is presenting artist-commissioned flags throughout the streets of the West End of London. Over 100 hundred flags designed by Joe Tilson will be displayed along Regent’s Street until August. The flags feature details from Tilson’s recent prints which are inspired by Venetian architecture. Cornelia Parker will also be featured with her flags, based on photogravures, festooned across Lower Regent’s street. The original prints which inspired these public works will be a prominent feature of our exhibition.. 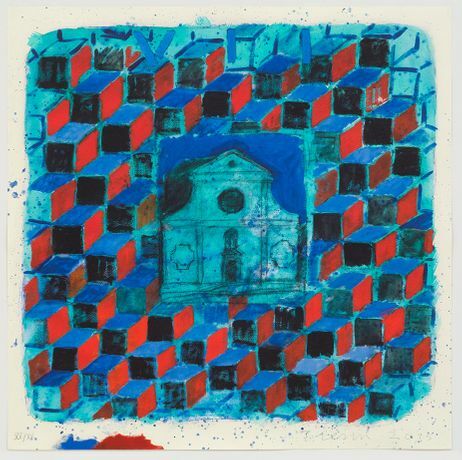 The Print Project Space presents an ongoing programme of public displays featuring prints and editions by the gallery’s roster of international artists.